FROST PARK RETROSPECTIVE ART SHOW AND RECEPTION! So... Vote now here on Feed>>Tacoma and congratulate the winners in person on Saturday night. by Dave_L on 10/22/2008 @ 10:45am HA - Thatâ€™s really cool! Thanks for setting it up; itâ€™s looks fun. And thanks to the secret judges - I feel honored to be included in the nominations! Lots of kudos to go around, including TacomaUrbanist for the hours it takes to run the weekly blog and to work on getting the sponsors. And all the photographers who preserve the fleeting work and make the images available to those of us who canâ€™t make it in person. by dawntown on 10/22/2008 @ 10:57am It has been put in my charge to design some very "valuable" trophies to present to winners of said catagories. I am open to any ideas you would like to see sitting on your mantle, or holding your toilet paper up on the back of the toilet. Everyone that votes can download, for free, this smart looking virtual VOTER BUTTON!!! Place it on your virtual vest... let everyone know that you are a dedicated Tacoma citizen who's voice has been heard. With this Virtual VOTER BUTTON local businessmen and politicos will know that YOU are someone that MAKES A DIFFERENCE. 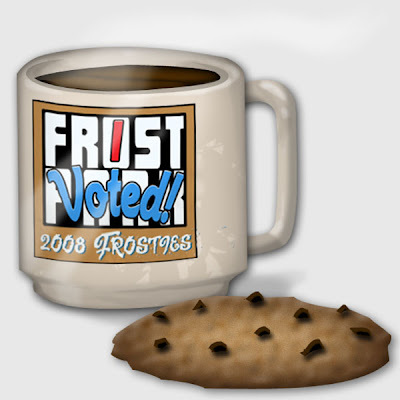 Enjoy some virtual coffee and cookies after you are done expressing your views at the poll. The coffee and cookies are free, but only to voters. by Erik on 10/22/2008 @ 12:58pm Nice work Stowe! Love it. by NineInchNachos on 10/22/2008 @ 6:46pm aweome! 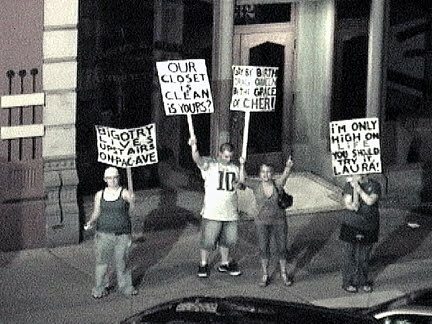 I want in on the virtual action... virtual picket line? by Courtney on 10/22/2008 @ 9:15pm Does anyone know if Jeremy "the Garfield Kid" is coming or Ariel? I'd love to see them there at the show! by NineInchNachos on 10/22/2008 @ 11:31pm Ms. Darcy and I just watched the frost park documentary dvd courtesy of Dave L. Nice!! thanks to everyone who came out and made memories. by NineInchNachos on 10/22/2008 @ 11:35pm Whatever happened to the garfield kid? by Dave_L on 10/23/2008 @ 10:45am "...dvd courtesy of Dave L."
I can't claim credit - the handful of DVD's I was able to hand out are courtesy of filmmaker Randy Sparks who wanted to provide copies for you guys. He can make more copies upon request; he's just been busy on another project so only had time to burn a half-dozen. BTW, I didn't know I was going to be interviewed, so my apologies for my incomplete explanation of how it all started. Only recently did I realize how many pieces came together to make it happen. by izenmania on 10/23/2008 @ 1:08pm Whatever happened to the garfield kid? Presumably he started school and was no longer free for Friday lunch.